I haven't been up to writing a lot due to being exhausted from running around so damn much. Doctor's appointments, another round of nerve blocks on May 2nd, physiotherapy (ended May 29, but I can go back if I need to), and two trips to different parts of the province thanks to my crazy now 14 year old son. First of all, my son has the habit of NOT telling me about a lot of stuff he's doing in school. Most of the time, I hear it from his friends, or in this case, his teachers. 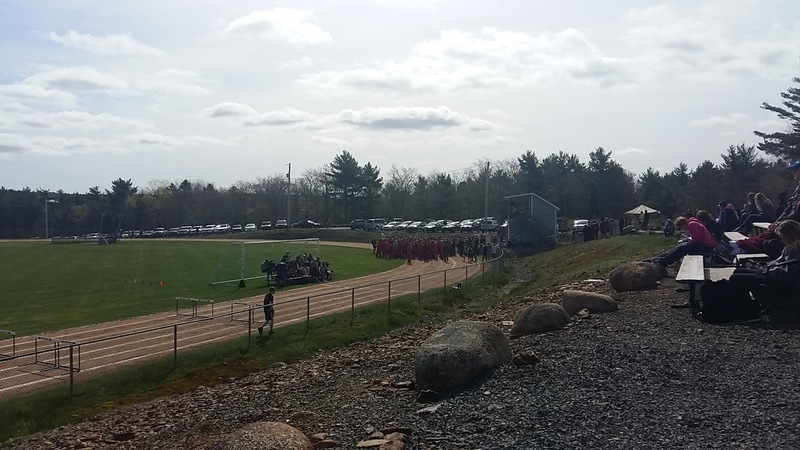 Middle of May: I get a text from his Resource/homeroom teacher, asking if I was able to pick up my son after Track and Field practice at my old high school.... And he would be competing in three events two days later, at the same school - shot put, long jump and the 100 m dash. Um, what? He mentioned doing shot put a few times, but only as part of doing exercises with his TAs, but never anything about being on the track and field team. Okay... I was early picking him up, and sure enough, he and two of his classmates were practicing all three events, and the rest of the track and field team were cheering them on. The District Championship was held a couple of days later, thankfully on a day Hubby was home. 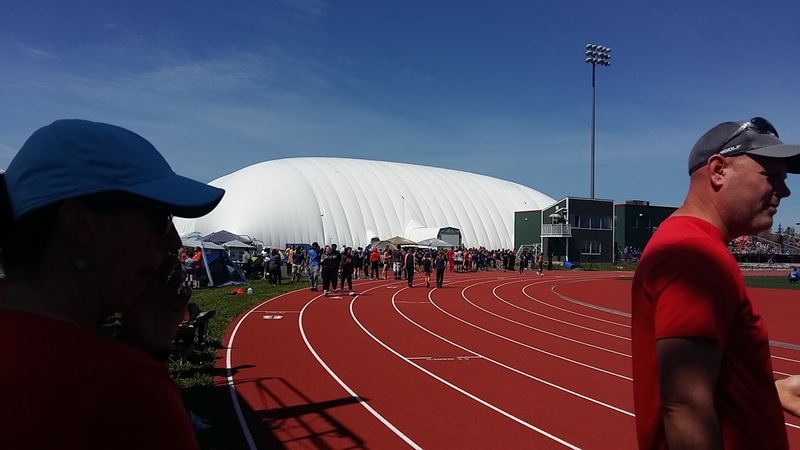 We coated ourselves in sunblock and fly dope, packed a lunch for everyone, and sat among the other parents as teams from across Lunenburg and Queens counties competed to see who would go to the Regional Championships the following week. District Championship, Park View Education Centre: All athletes gathered at the announcer's booth, listening to instructions. 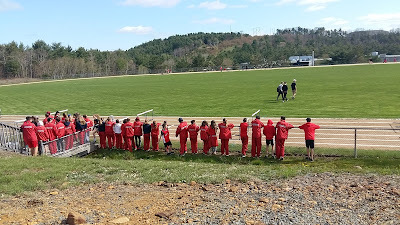 District Championship: Part of the "Sea of Red" aka Patriots (Son's Team) rooting for all of the track athletes competing. Son didn't do well in the long jump. He would run to the line, stop dead, and hop. He is scared of hurting himself, and after watching some of the senior high kids do it, he has decided it's not for him. The 100 m dash wasn't great either. He placed last in his heat, but everyone still screamed for him. I thought he didn't do great in Shot Put either, but apparently he did. I thought he placed 9th or 10th in his division, but found out later that week he did well enough to represent the school in the Regional Championship. 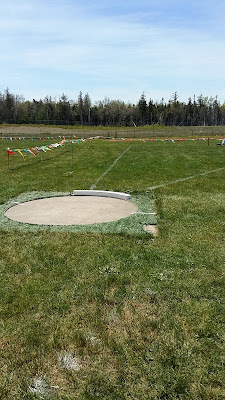 May 25, we arrive at Acadia University in Wolfville, an hour's drive northeast of us, for our son to compete in the Junior Boys Special Athletes division, Shot Put event. 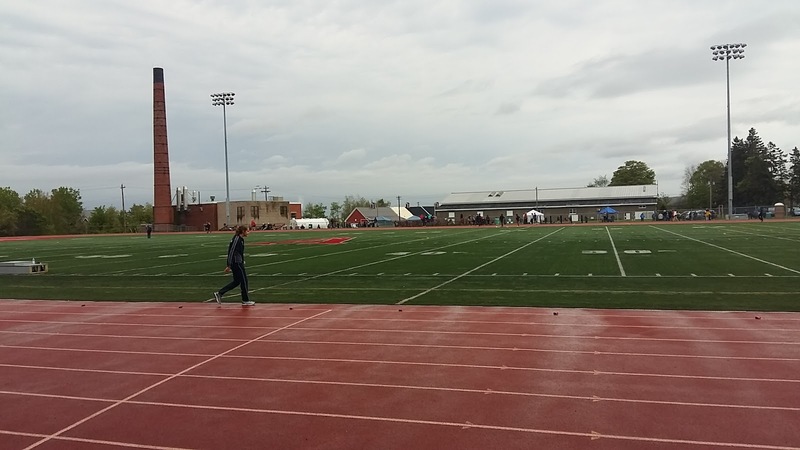 Western Regional Championship: Raymond Field, Acadia University, Wolfville, NS. All of the kids did an amazing job. I saw a lot of the girls and boys from our team win their heats, and even found out a few were going to the Provincial Championships. The top six or eight from the Jr. Boys Special Athletes Shot Put would be going to the Provincials. The winner was a boy of about 14 or 15, and he biffed the shot put over 10 metres (over 32 feet) for the ribbon. That kid is amazing! The second place winner had a throw of about 8 or so metres. Third place was 3.88 metres - I know the exact number, because it was my son that made that throw. It was his best to date. 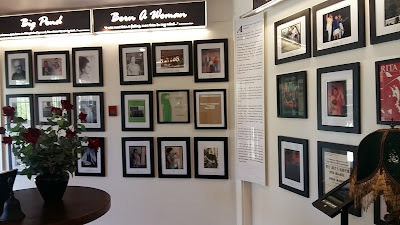 I almost fainted and Hubby grinned from ear to ear when we clued in what our son had accomplished. 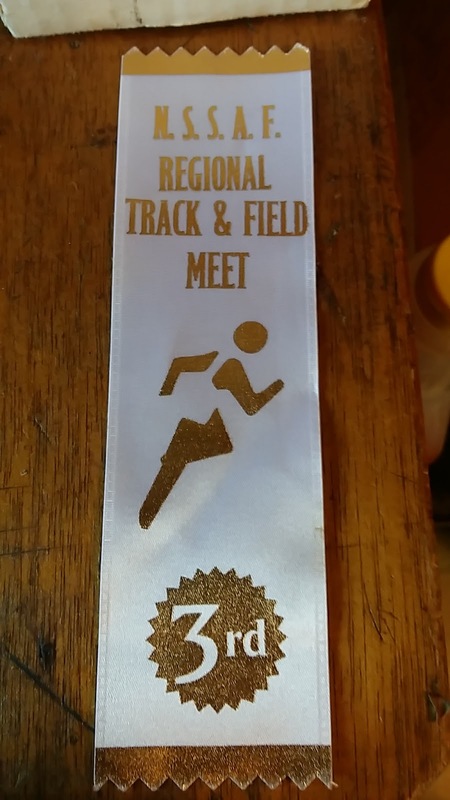 Son's Third Place ribbon for Regional Championships in the Shot Put Event. 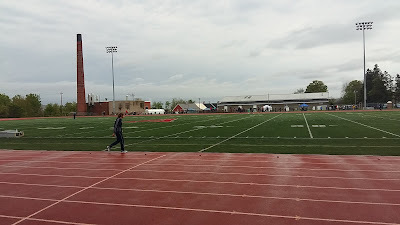 His first year on the Track and Field team, and he was off to the Provincial Championships, which was held in Sydney, NS, at Cape Breton University this year. May 31: Son and I leave for Sydney with one of his TAs, the other special athlete who made it to Provincials (ironically in shot put too), and his mom. I was squashed in the back seat of an SUV with two crazy kids for six hours one way. We left around 11 that morning, got to the hotel around 6, relaxed for a bit while we got organized for the night, and went out for supper with the rest of the team and coaches. Just hanging out with everyone and feeling the camaraderie was amazing. I wasn't athletic in school, in fact, I was the fat girl, a target for a lot of the kids back then. I was in band while in junior high, but I was still a target for a lot of the other participants, because they were popular and I wasn't. So I never experienced what it is like to be a part of something like this. Everyone on the team was really supportive of my son, and all of them made an effort to say hi to him at some point, even allowing him to hang out with them at the hotel after we ate. Canso Causeway, between the Nova Scotia Mainland and Cape Breton Island. Cape Breton University is almost as beautiful as Acadia. The track isn't set up for Canadian rules Football, and they have an enclosed soccer (regular football) field. It's also a newer campus, so it's a bit more modern looking, and a bit more sparsely laid out right now. 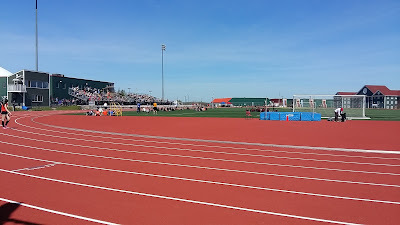 It was a great setting to see the best of the best student athletes competing. 183 schools from across the province were represented, some with only 1 or two athletes, others like Son's school had at least 15 to 20 students participating. 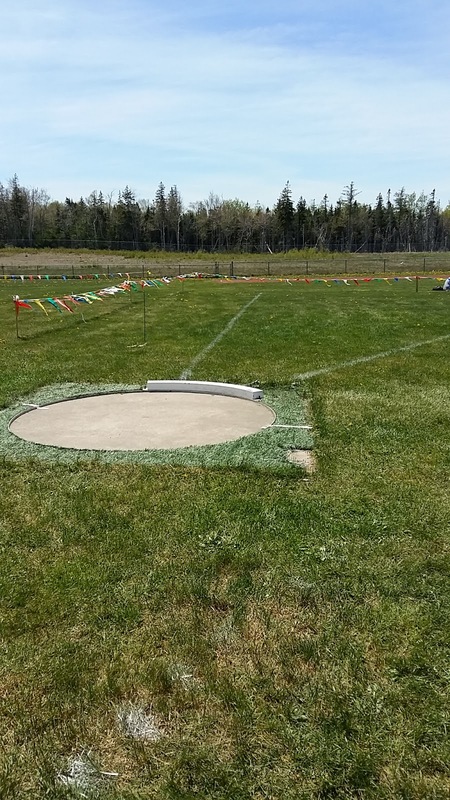 Cape Breton University track, just outside of Sydney, NS. That white "tent" is a covered soccer (original football) field. The athletes can play year round in all kinds of weather! Son did his bit in shot put, and even got a new personal record: 4.21 metres (13 feet, 10.75 inches). However, that wasn't enough to get him a medal. 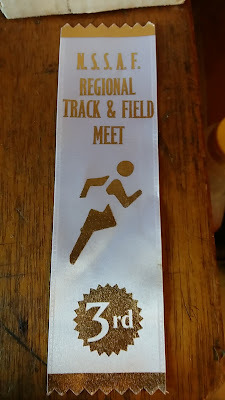 The boy that took first place in the Regional Championship got a record too, of 10.91 metres (over 34 feet), and third place was over 7 metres (22 feet, 11 inches). Even the girls were shooting at least 5 to six metres. Son wasn't happy he didn't place, but his friend/teammate didn't place either. Son took 9th place, and his pal took 10th. The competition in their division was TOUGH, and they did great to get what they did. 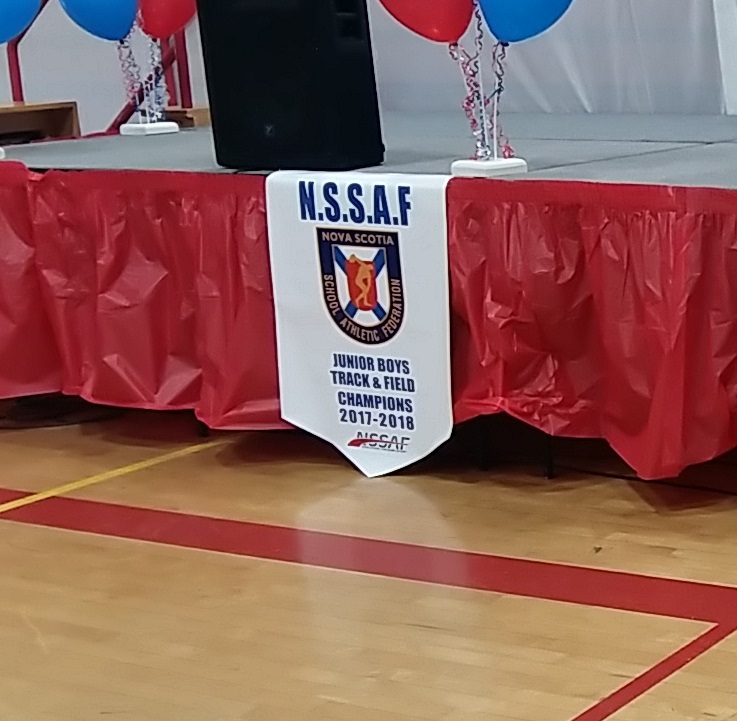 Personally I was so proud to see my son make it on the team... Making it to the Regional championship was awesome, but getting third, and making it to the Provincial championship was just the icing on this ultra fast moving and fun cake! We made our way home after the results were announced, after wishing the rest of the team all the best in their events. Some of the boys had already won medals, and a lot of the girls had placed high in their heats, so spirits were high. We also made a stop on our way home... Rita's Tea Room. 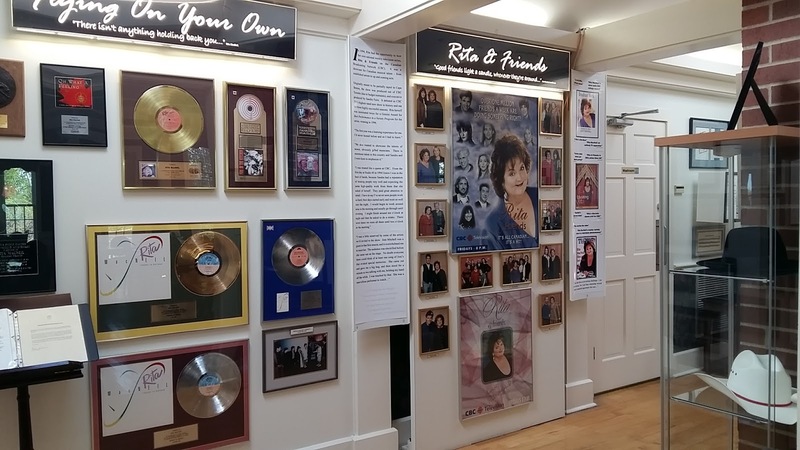 This was the home of singer Rita MacNeil years ago, and she converted it to a tea room in the 1990s. 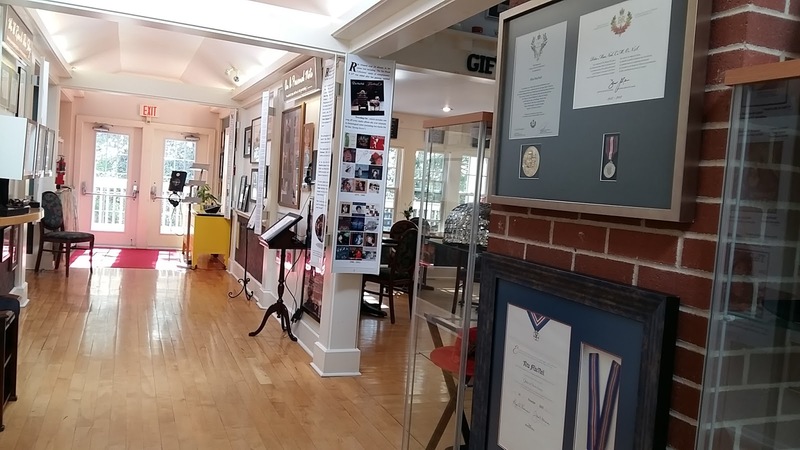 After her death in 2013, it has become a beautiful memorial house for her, featuring information about her entire life, musical career, and how much she loved Nova Scotia. It is a gorgeous spot in the springtime as the flowers are in bloom... 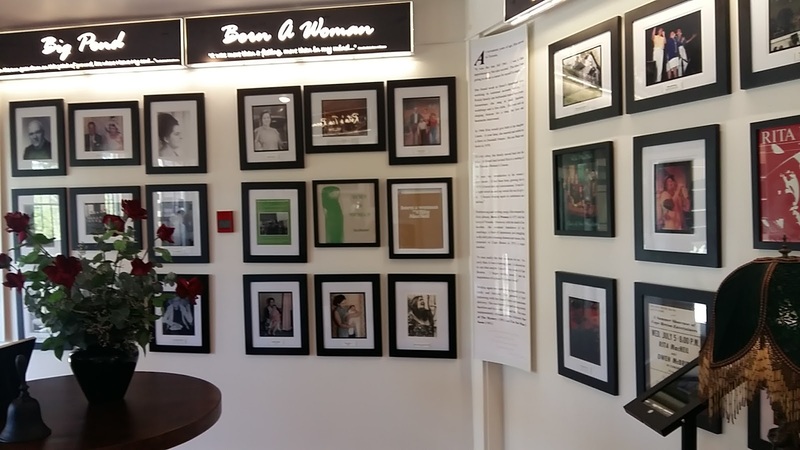 It's just as pretty inside, with so many things from Ms. MacNeil's career and life on display, and gorgeous decor. The boys had cheesecake with blueberry compote with a glass of pop, while the three of us girls had tea (house blend) with strawberry shortcake tea biscuits. The tea was fantastic, and the dessert was out of this world delicious (Yes, I had sugar, I was careful and didn't eat much other than veggies for the rest of the day!) 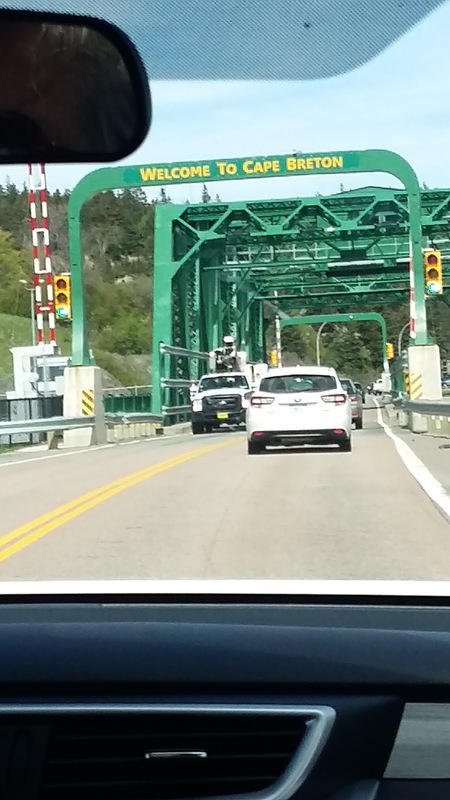 I recommend all who are on the eastern part of Cape Breton Island - Big Pond area - to go there. It's well worth the stop! We got home Friday night at 10 p.m., less than 36 hours after we left for Sydney. I found out on Sunday that the boys took home the Intermediate GOLD, and the girls did really well too (I'm not sure where they placed, sorry). The 2017-18 championship banner for Junior Boys Track and Field. Apparently Son was getting an award on Awards Night this past Thursday... We went, and it turns out he was getting his certificate of participation for competing in the Provincial Championship. He was so excited! All of his friends, including the two students who won Athlete of the Year, congratulated him, and even showed them their awards! I'd say it was a successful year. If Grade 8 is even half as good as Grade 7 was, it's going to be phenomenal! On a final note, I am back to work on a manuscript... I'm refitting an old draft I wrote a few years ago. I'm not sure if it will ever be sent out or not, or if it will be a standalone book or part of a series, but I am working again. It feels good to be back into it, after feeling so crappy for so long. Hopefully things hold off until school gets out, three weeks from now. Have a great day everyone... I leave you with "She's Called Nova Scotia" by Ms. Rita MacNeil. Read the lyrics HERE.